Description: Quite simply the best! 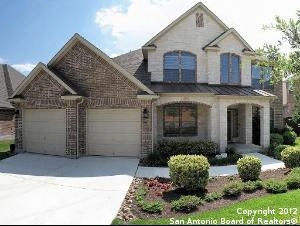 Put on the ritz: best floor plan for entertaining & livng w/ $75,000 plus in upgrades on greenbelt! Master bedroom retreat, 5th bedroom & study are down! Breathtaking antique hickory & washington cherry floors. Media room could be 6th bedroom! Level 3 granite, , stainless double oven convection, 42 in cabinets, simply pur water fliter, under cabinet lighting, patio audio speaker package, awesome deck & pergola, full gutters, metal roof accent... Walking distance to lazy river/ pool!